My favorite place to stop for a photo on the Haul Road, shortly before the left fork to Memorial Park. I can’t think of a more enjoyable ride than the Haul Road in the spring. It reminds me of the Star Wars scenes from Return of the Jedi on the moon of Endor. That was filmed in Crescent City at Redwood National Park. While it was not as hot as yesterday, it was still warm in places. The Haul Road is usually perfect on hot days, as it was today. I saw a couple of hikers on the road, but that was it. It’s usually empty of people. 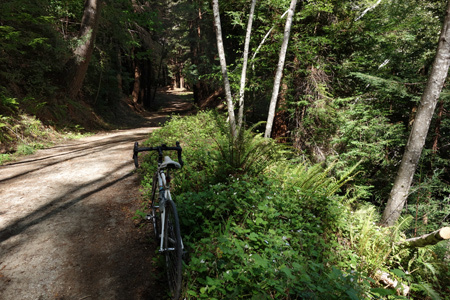 Pescadero Creek at the Bailey Bridge can’t be beat for losing yourself in the moment. Click here to view full image. This entry was posted on April 28, 2013 at 3:36 pm and is filed under Ride reports. You can follow any responses to this entry through the RSS 2.0 feed. You can leave a response, or trackback from your own site.